Q (From ask.fm): Why did you choose to major in chem? What did you plan to do with your chem degree? In high school, I wanted to do pharmacy. I shadowed a pharmacist and she told me that chemistry was very important to know as a pharmacist. So, I began by taking AP chemistry in high school and I fell in love with the topic. When it came to choosing my college major, I actually intended in following in my older brother’s footsteps of majoring in both chemistry and biochemistry because I knew that biochemistry would be applicable to my future. As I could only list one major as my top choice on my application, I just randomly put chemistry first and biochemistry second, and ended up getting placed in the College of Science and Engineering with the intention of majoring in chemistry. I hoped to then add on the biochemistry major as well, but with it being in a different college, the College of Biological Sciences, it was a challenge to meet the requirements of both colleges and complete both degrees in four years. Therefore, I decided that instead of actually adding in the second major, I would simply take all of the upper level classes related to biochemistry/biology as I desired to know what their upper division students know without their excessive introduction to biology courses. Throughout college, my interests shifted from pharmacy as a professional career to research pertaining to the development of therapies and further to clinical medicine to complement that research. It was that interest in therapies that kept my interest in the chemistry major as chemistry is the basis for drug design. I knew I would later be able to shift my primary focus to more biological sciences but I believed the background in chemistry would make me a better biologist. 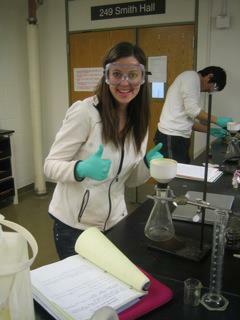 While I’m no longer doing just straight-up chemistry, I do not regret the decision to keep that as my major. I’m lucky that my university was flexible and allowed me to take classes outside my major rather freely, so that I was able to have a broad education in the physical and biological sciences that well prepared me for my future. Interesting! Not my cup of tea, however. Next Next post: Why Medicine?